Spresent is the best "Web Powerpoint" service out there that lets you create very impressive and "interactive" Flash presentations in seconds. If the hunt for Google Powerpoint is still on, Spresent is one tool that Google should seriously consider. Spresent has a simple and intuitive drag-n-drop interface with all the standard tools that you normally see in existing web Powerpoint services. Like Microsoft OneNote, you can select objects and place them anyone on the screen. Spresent offers seamless integration with Flickr - you can directly import pictures from Flickr into Spresent and either create slideshows or just use them to enhance the existing slides. Youtube Video clips can be embedded in the Web presentation using the web image object. Playing live streaming video in a presentation is so cool. 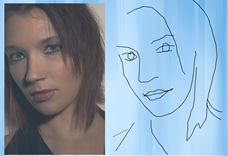 Using the freehand pen tool, you can trace pictures or paint rough sketches. The pen movements are captured and they playback in the same style as they were drawn. 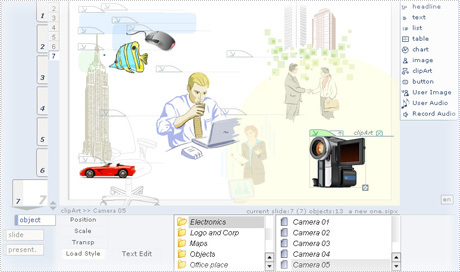 The gallery browser or library has a vast collection of cliparts, background graphics and vector animations for your slides. Another impressive feature are the interactive 3D excel bar and pie graphs that can be modified even while the presentation is non-edit mode. And during the play mode, Spresent provides a set of screen pens for annotating the running presentation which is surely a very useful feature. Highly recommended.